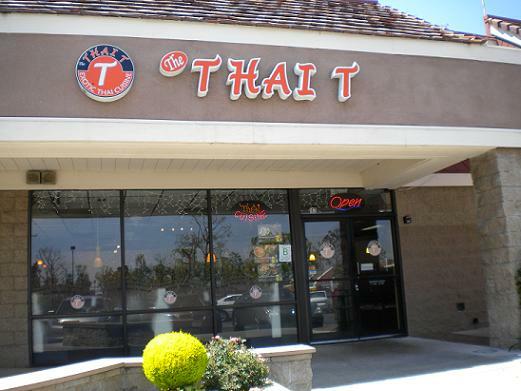 In the Orchard Supply/Big Lots center, The Thai T isn’t in the flashiest location, but I’ve been there a half-dozen times since its opening a few years ago. The restaurant has plenty of windows for natural light. The atmosphere, and the service, is quiet and serene. And the food’s better than average. 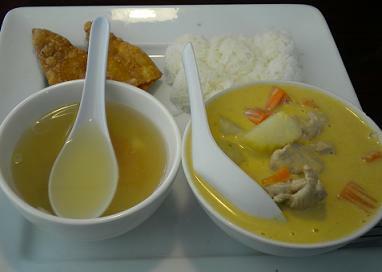 At lunch recently, I had the yellow curry (pictured) with pork, simmered in coconut milk with potatoes and carrots. My friend had broccoli with oyster sauce with shrimp. We both liked our meals, and he noted favorably the fresh, not frozen, shrimp. The 13 lunch specials are $7 with pork, chicken, beef or tofu or $8 with shrimp. They come with a small salad, soup, steamed rice and fried wonton. My Thai iced tea was refilled for free, a rare touch. Everything I’ve ever had there has been good. It’s a nice little place, not spectacular, not a destination, but a solid choice if you’re in the area. But note the B in the window. 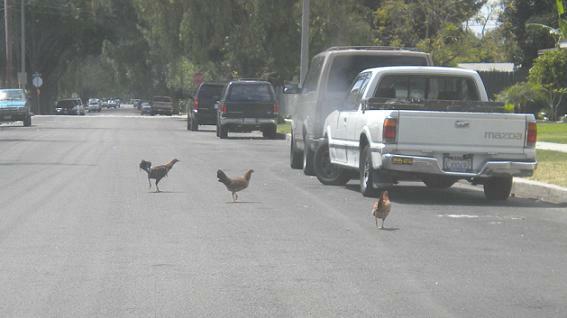 Why did the chickens cross Nevada Street? Out and about on Wednesday afternoon, I drove east on Nevada Street in Ontario from Sultana Avenue to get a look at demolition of the Sunkist plant, saw that the street dead-ended and turned around. In the meantime, three chickens had crossed to the middle of the road. Not a sight you see every day, or even any day, so I shot this photo through my windshield. I was hoping the chickens would cross to the other side and then give me an exclusive interview as to why, but they scuttled back to the north side. Looked like they live there — there was a fenced lot with a gate standing open and a man inside working. As I waited for my order at Zankou Chicken in Pasadena on Sunday, reading LA Weekly, a burly man approached my table and asked if I was a writer. This stranger turned out to be The New Diner, the food blogger from Diamond Bar who hits restaurants all over not only the Inland Valley but all over L.A. to boot. He might be in Chatsworth one day, Anaheim the next and Long Beach the next. We’d e-mailed a few times but hadn’t met. As a reader of his blog, I knew not to praise the people of Orange County (whom he reflexively refers to as “the pretentious, jerk people of Orange County,” for instance, here) or to talk any trash about the late Baltimore Colts quarterback Johnny Unitas (the subject of a New Diner spinoff blog, Unitas We Stand). It was cool to meet him. He was at Zankou for his blog, I was just there for a meal. Read what he had to say here. I like Zankou too. 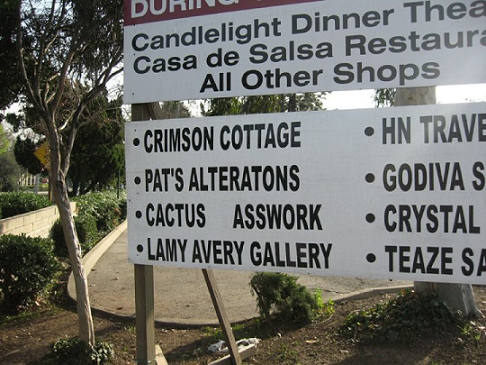 The “open during construction” sign at the Old Schoolhouse center in Claremont could stand to make an “alteraton” to the Cactus Glasswork name, which is missing a couple of crucial letters. In the meantime, be careful sitting down! 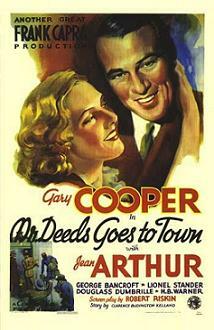 This 1937 screwball comedy is among my favorite movies. Working girl Mary Smith (Jean Arthur) is riding atop a double-decker bus to work when what should land on her but a mink coat, tossed out a penthouse window by a millionaire mad at his wife’s spendthrift ways. Hijinks, as they say, ensue. Read about “Easy Living” here. And watch a 2:49 video clip below. Rancho Cucamonga’s Jack Benny statue was among the celebrity statuary featured in an L.A. Times piece Sunday by Steve Harvey (the former “Only in L.A.” scribe). Yours truly is quoted. Read it here. Photo shot April 18 at Foothill and Fruit in La Verne. A Panera Bread is coming to the site. 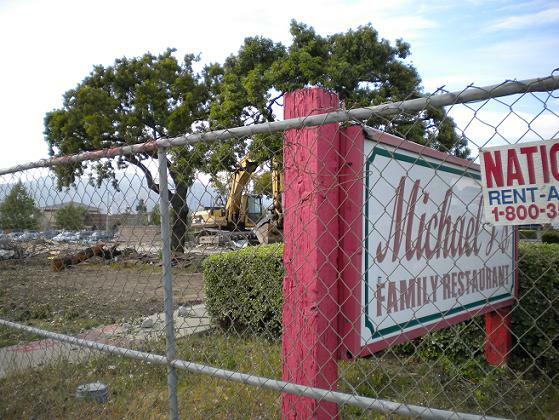 Here’s a farewell to the Michael J’s chain with plenty of comments. El Merendero, which already had (and still has) a La Verne location, was a pioneer in downtown Pomona, arriving in 1980 and occupying the corner of the Fox Theater building until moving a block away in 2008 to much nicer quarters. Check the lovely mural. The new location has table service too. Alas, two years in, service remains shaky. I’m not sure the expanded menu has adjusted to the new surroundings either. Five of us ate there prior to a concert at the Fox. Chips and salsa arrived. We liked both but the salsa’s presentation in a plastic to-go container, with a lid, hints at the awkward transition to a full-service restaurant. Our table had two enchiladas ($5.95), a chile relleno and carne asada ($8.50) (pictured), camarones rancheros ($9.25), a chile relleno ($5.95) and a milanesa steak torta ($4.95) (also pictured). The first three plates were enjoyed by their diners; the camarones customer was impressed by the number of shrimp. My torta was acceptable, although I’ve had better. The solo relleno diner, who’s more exacting, said it wasn’t cooked through and had a crunchy rather than soft exterior. She doesn’t intend to go back. The service was friendly, when we got it; nobody came to the table for the first 10 minutes (the first-timers began to wonder if they were supposed to order from the cashier) and at the end, the credit card transaction took at least five minutes. 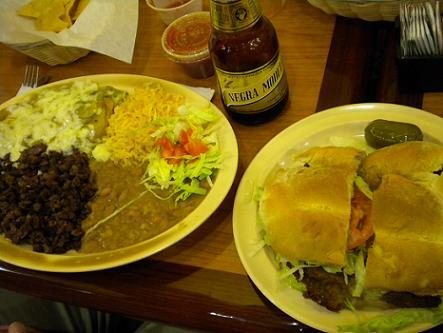 I like El Merendero but have to say it’s not my first choice for downtown dining. Somehow I liked it better when it was basically a taqueria and burrito joint in the then-dumpy Fox and you ordered at the counter. The new location raises expectations but can’t quite meet them. 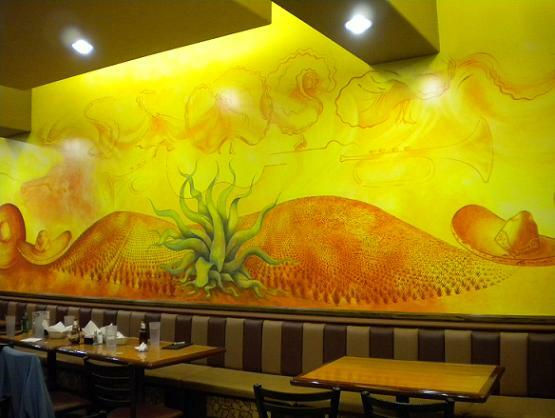 That mural sure is pretty, though. Next door is El Merendero’s popular panaderia, which moved along with the restaurant and seems to have made a more successful transition. Longfellow Deeds is a tuba-playing dreamer in tiny Mandrake Falls, Vt., who inherits $20 million and stumbles around wondering what to do with his newfound wealth. The movie stars Gary Cooper and Jean Arthur. Read more about it here. The movie screens at 6:30 p.m. in the community room of the library, 215 E. C St. See you there? Today marks the 100th anniversary of Mark Twain’s death in 1910. We’ll all be marking the occasion in our own way, I’m sure. 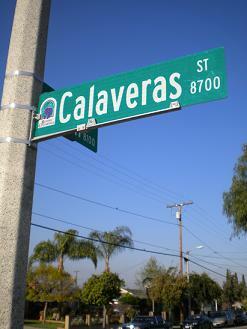 What will they be doing on this Rancho Cucamonga street (near 9th and Grove), I wonder? After all, the story that catapulted Twain to fame, and remains one of his most enduring pieces, is “The Celebrated Jumping Frog of Calaveras County,” a tall tale set in a Gold Rush county in California. If you’re so inclined, you can read the full text of the story here.